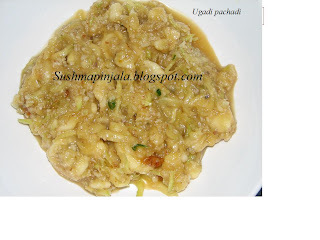 In a bowl add grated coconut and curd to condensed milk. Mix well and add elachi powder. Steam this bowl in rice cooker or idly cooker for 30 mits. Grease the button idly tray with oil and fill them with idly batter. Steam the trays as u usually do for the normal idlys. Remove the idlys and cool. 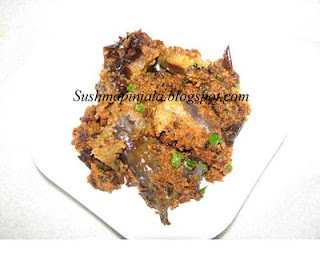 Saute for few seconds and add idlys. Now add salt and chilli sauce. Fry for 5 mits and finally add chopped cilantro. Serve hot as it is or with any chutney. Ugadi is telugu new year. It has been said that on this day whatever we do, we keep on doing for the rest of the year. As in life we experience happiness, sorrow, bitterness etc. We make a chutney called ugadi pachadi, where we use all sorts of tastes like tangy, sweet, bitter, hot etc. So life has to be a mixture of all these tastes. 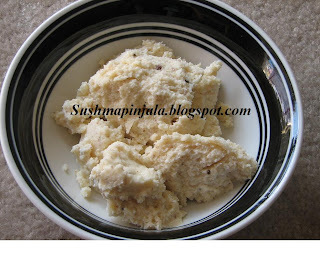 This pachadi is soo simple to make. Just mix all the ingredents mentioned above. And enjoy.